A fun way to play golf & change your perspective on the difficulty of the game, whether an avid golfer or passive one, is to play at night. Say what?! How is it even possible for you or me to go golfing in the dark? With the right materials, it surely is…. At Enger Park, we have stocked up on glow balls that stay lit for 8 minutes after each contact, resetting the battery for another 8 minutes. Necklaces are for safety and they're just cool to wear! 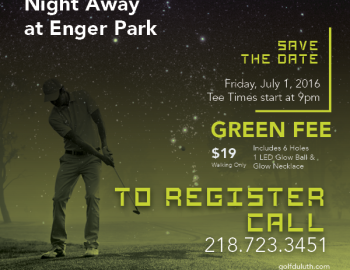 We are very exited to be hosting our first Night Golf event this Friday, July 1st. For only $19 per player, you will get the materials to participate in this made for fun event. Tee-times begin at 9 PM. Great food & refreshments will most certainly be available before play begins. It's a great way to kick off the Holiday weekend - call us at 218.723.3451 to register yourself or as many people as you would plan to have participate.